∆DEEN! 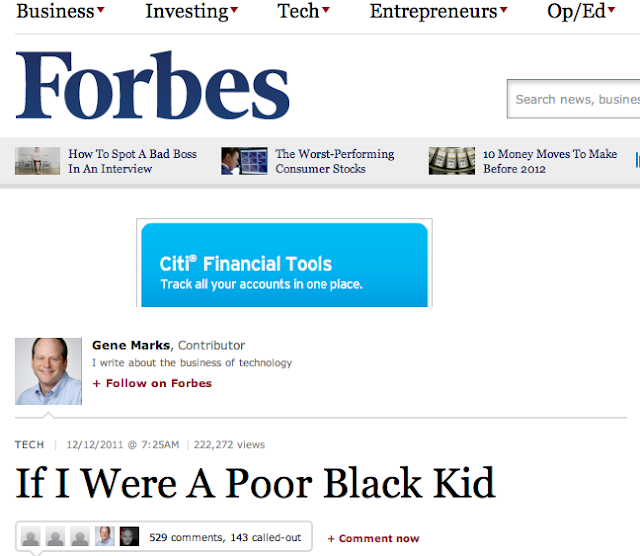 : "If I Were A Poor Black Kid"
This is a very interesting article written by someone who obviously has never been through any of the things he's talking about. Granted he says that, but he lists solutions, withOUT listing ANY of the problems. Which you just, CAN'T do. It really invalidates his entire article. He's never been jumped for carrying books home, coming back from school. He's never been beat up for answering too many questions right in class. He's never been through any kind of struggle to even be able to talk about it. He constantly reminds the reader that he knows its "difficult" and how hard it is. But he has NO idea what some kids go through. Not saying I myself have gone through it, but know so many people that have. Anyway, read it and let me know how it makes you feel. The saying, "ignorance is bliss" rings very true for this article. The worst part is that the author states that he stands by his beliefs, even though the majority of comments left by all types of people (different races and classes) prove him wrong! Looks like Forbes only has close-minded columnist.